"Something Better at a Budget Rate"
Located in Iron Mountain, Michigan in the Upper Peninsula, the Budget Host Inn offers clean modern ground floor guest rooms and large kitchenettes with one or two adjoining rooms for large groups. The Budget Host Inn of Iron Mountain is conveniently located on Highway US-2 on the north side of Iron Mountain. King Bed in one of our comfortable motel rooms. Direct Snowmobile trail access with ample trailer parking on our new large parking lot. Close to Lake Antoine, Pine Mountain Resort, the new Bay West College Campus, and many other recreational attractions. Minutes away from dining and shopping. Snowmobile and ATV rentals one block north of the Budget Host Inn. 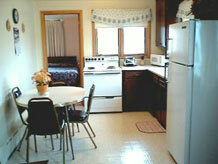 The Budget Host Inn of Iron Mountain, MI also offers kitchen units with full sized appliances, microwave, and a coffee maker. There is a sleeper sofa in the living area and a connecting bedroom with two queen beds. If planning an extended stay, you might want to bring a few dishes and cooking utensils. At a Budget Host Inn, the traveler enjoys consistent high standards at budget rates, plus the bonus of warm hospitality so traditionally associated with predominately family-owned and operated inns. Apartment with full kitchen, living area, and a bedroom. AARP and Commercial rate. Daily, weekly, or monthly rentals. All major Credit cards accepted. Fax machine in office. The 1800-acre Fumee Lake Natural Area is open year round free of charge for non-motorized activities. (map) There are trails for walking, biking, and horseback riding with opportunities throughout the area for photography and bird watching, Go snowshoeing or cross-country skiing in the winter or canoeing on Fumee Lake. For the adventurous, go Whitewater Rafting at Northwoods Adventures only a few miles northwest of the motel. They will transport you, the raft, and your guide to Piers Gorge on the Menominee River, one of the top whitewater rafting runs in Michigan. Go Golfing at Timberstone or the Norway Golf Club or play Mini Golf or ride go-karts at the Bear's Den in Spread Eagle, Wisconsin 7 miles northwest of the Budget Host on Highway US-2. Want to know a little about the Iron Mountain Area? Visit the Menominee Iron Range Historical Museum Complex including the World War 2 Glider Museum, The Cornish Pumping Engine and Mining Museum, and the Menominee Range Historical Museum. For an up close adventure take a guided tour of the Iron Mountain Iron Mine (State Historical Site). Ride the underground train and see the unusual rock formations and the large underground lighted cavern where iron ore was mined. Winter brings lots of outdoor activities with easy access to the snowmobile trail from your motel room. Groomed cross-country ski trails are at City Park, and you can go snowshoeing or ice fishing near the Budget Host. 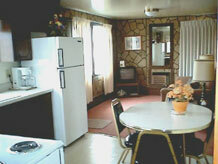 Lodging, motels in Iron Mountain, MI in the Upper Peninsula of Michigan.